There’s a restaurant in Peterborough called St. Veronus, where I was first introduced to the deliciousness of the spiced pickled beets. Beets on their own, boiled and served with butter, are terrific, and pickled beets are fine, but spiced pickled beets are something else altogether. My sister Sammi found this recipe a few years ago, and while it’s not exactly the same as the beets they serve at St. Veronus, I might believe that these beets are better. I think I’ve said before that I’m not a proponent of specialty gadgets and tools for cooking, but some things I do endorse. A kitchen scale is excellent, and if you’re canning, a wide-mouthed funnel is really helpful. As well, if you’re doing the hot-water method of canning, a set of hot-jar-grabbing tongs is completely useful. Note: I’m not a canning expert, just an enthusiast, so please do more reading before you start to make sure you’re doing it safely. Wash your 500mL jars, new lids, funnel, ladle, and any other tools in hot, soapy water. Allow to air dry. Cut leafy greens and stems off beets; place beets in a pot. Cover with water and boil until tender. 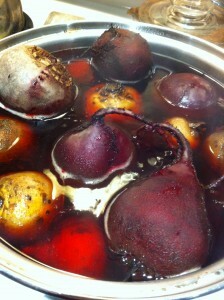 Cool beets, and remove skin (skin will come away easily with your fingers). Slice beets into bite-sized pieces (no more than 1/4″ thick). Combine vinegar, salt, sugar, spices, and water in the pot. Bring to a boil. Add beets to the pot. Bring mixture to a boil. Reduce heat, and simmer for 5 minutes. 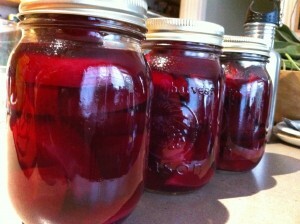 Using a ladle, fill jars with hot beets and brine mixture, leaving a ½ inch headspace at the top. Using a rubber spatula or similar, remove air bubbles by running it around the edges of the jar as needed. Process the jars of pickled beets in a boiling water bath for 30 minutes (if you’re more than 1000 feet above sea level, water bath times are different! Look them up online before starting). You can eat them right away, but I feel like it takes at least a week to really develop the flavour.